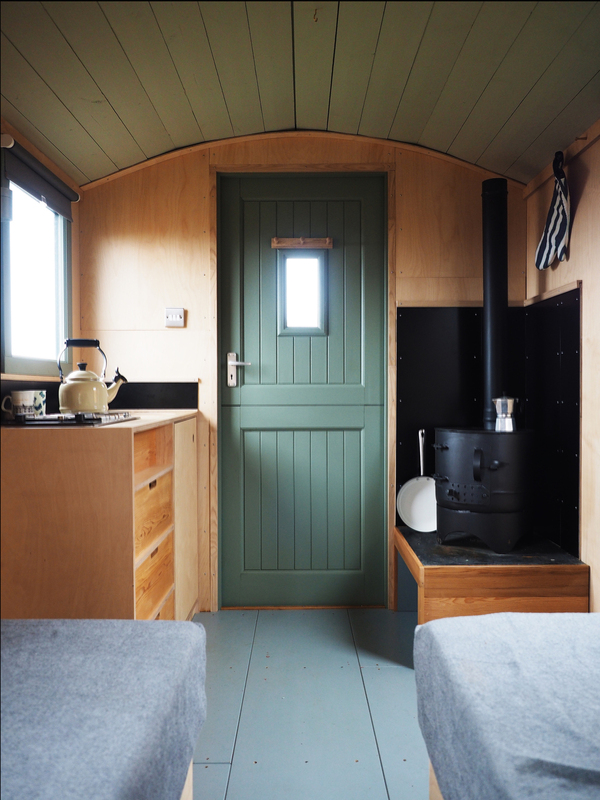 The cosy Shepherd's Hut combines the best of past traditions with the comfort of today. Inside is everything you need for a comfortable cosy night's sleep, but still with enough space to relax during the day. The Shepherd's Hut sleeps two; the bed can be made into a double or two singles. There is a wood burning stove and we provide wood, electricity ( but just enough to charge a phone or computer or listen to the radio), water and sink, a two ring gas cooker and table. The fridge is in a small shed, just outside where you can store luggage and food. There is a composting toilet with an amazing view! The Hut is great for couples and good friends looking for somewhere to relax. Dogs are welcome at The Shepherd's Hut but we are on a farm so we ask you to keep a close eye on your dog. We provide bedding, a hand towel, tea towels, toilet paper, washing up liquid and tea/coffee/sugar, but not bath/shower towels. The Shepherd’s Hut costs £50 per night and we will pick you up and take you back to the ferry if you wish. For availability see calendar below. For booking or enquire please email us or click on the booking link below.